In 9 Circles you control your little stickman character with just two buttons – one to flip the gravity and one to change your stickman’s color. The effects of flipping the gravity are self explanatory but changing your stickman’s color means that he can pass through similarly colored walls and floors. Your stickman auto-walks through each level and you need to use your gravity flipping/color changing abilities to guide him so that he collects all nine circles in each one. The first couple of levels in 9 Circles are relatively easy, but soon deadly hazards are introduced and you need to think fast to keep your stickman safe while traversing each level. The speed that the various hazards come at you mean that it’s very easy to panic and press the wrong button accidentally, sending your little stickman to his doom. It’s a very tough but addictive little game with a great visual style, clever level design and fast paced gameplay that manages to squeeze a surprising amount of complexity out of just pressing two buttons. 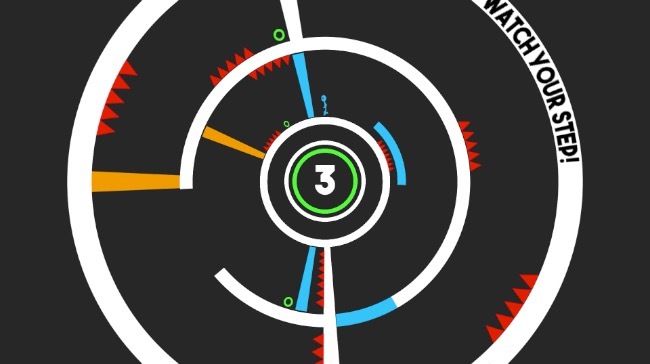 A challenging circular platformer well worth getting a-round to.